Are you looking for a quick getaway from everyday life? If so, the Tropical Islands are perfect for you! 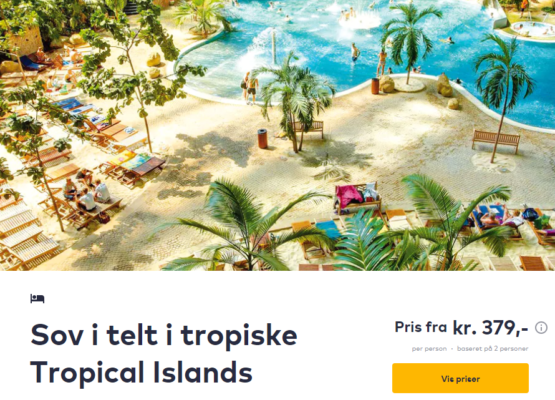 From only 379 kr per person, TravelBird offers you two super relaxing and fun days at the tropical theme park. Additionally, the offer includes a stay at a 2-person-tent in Tropical Islands and a rich breakfast. Tropical Islands is located approximately 60 kilometres south of Berlin. Situated in the world’s largest free-standing dome, Tropical Islands features an indoor rain forest and has a number of different themed areas, so you will for sure find something you really enjoy. The different areas of the park are the Tropical Village – which has copies of buildings from Thailand, Samoa and Bali, the Rainforest, with numerous plants, the Tropical Sea – a pool designed like the waters of a coral island featuring a beach, and the Bali Lagoon where you can relax in whirlpools or have fun on water slides. Furthermore, you can find a 4,000 m² kids play area at the theme park and even a sauna and spa facility – in fact, the largest tropical sauna complex in all of Europe. For the real adventurers among you, there is a 27 m-high water slide tower at Tropical Islands with four slides and an unusual but pretty cool golf course. There are dates available from November – December 2018, just click on the link and see if you can find something that fits with your schedule. Searching for flights to Germany? Check out Skyscanner for the best prices. Let’s go to the Tropical Islands deal! Sign up for my Newsletter, and don’t miss anymore deals. You’ll be the first to find out about our Tropical Islands bargains! what do you want to know? 🙂 I’m happy to help! thank you for your comment. Unfortunately, we can’t give you any additional discount. Looks like a great deal !! !